If there’s one thing that I’ve learned from this whole house-move, it’s that I am in dire need of a paper shredder. The amount of documents, scraps, and Bed & Bath coupons that I have accumulated over the years is just ridiculous. The cats have somehow claimed these piles (why do they do that?) and if anyone were to ever see this mess, one of those reality shows would probably bust down my door. I can just see it now, The Clever Carrot: Secret Hoarders of the Blogsphere. And, I think creatures might live in there. In honor of simplicity, today’s recipe is an easy cauliflower soup. I saw this on America’s Test Kitchen and they did something really cool with their preparation; they cooked the cauliflower in batches. Why bother? Can’t you just throw it all in at once and be done with it? Apparently, this adds depth of flavor. First, you cook 3/4’s of the cauliflower for about 30 minutes to develop a deep, nutty sweetness. If you’ve ever had roasted cauliflower before, you already know how yummy and sweet they get. Then, the remaining cauliflower goes in for only 15 minutes, which lends a ‘bright & grassy’ note according to the chef. The big cauliflower stem, sliced thin, is also used to add creaminess to the soup. In addition to this unique cooking preparation, water is used instead of stock. I barely ever use water in my soups because I think of it as bland and boring (well, because it is). 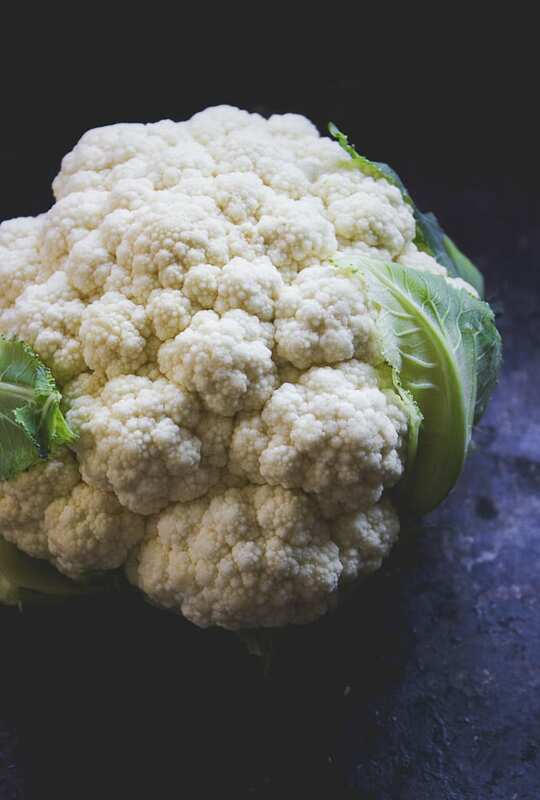 But in doing so, you can really taste the cauliflower without it being lost and muddled amongst the other ingredients. I also add toasted panko breadcrumbs and pretty purple chive flowers from the garden. As I gaze up at these photos, it will never cease to amaze me how simple dishes can seem so baffling. Really? Just cauliflower and water? Cooking in batches? What? I’ve learned that it takes some serious constraint to do simple food, because overdone recipes tend to be more ‘impressive’. But to me, less is more. Always. 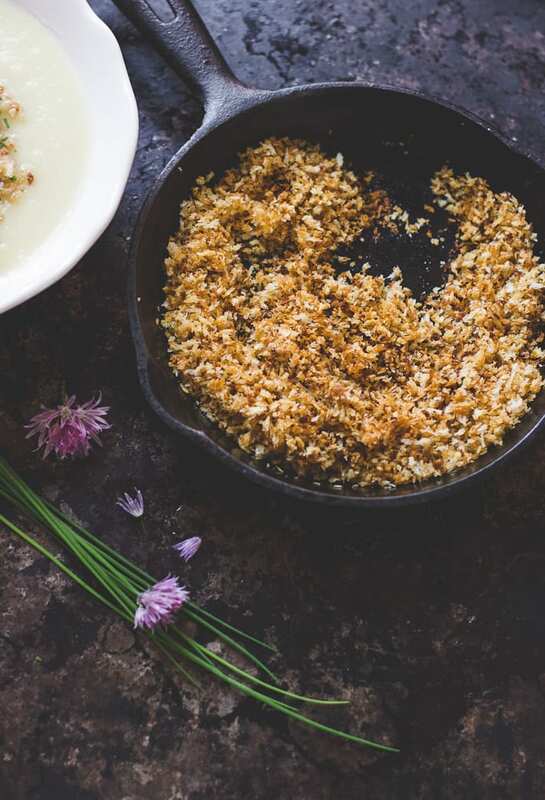 In a small saute pan, gently toast the breadcrumbs with a little olive oil until golden. Season with salt and pepper. Transfer to a bowl and set aside until ready to use. In a large, heavy bottom pot warm the butter and olive oil over moderate heat. Remove the large stem from the cauliflower, and thinly slice into rounds. Cut the rest into florets and toss together to combine. Thinly slice the leek and onion, and add to the pot. Saute for about 3-5 minutes or until soft. Add ¾'s of the cauliflower, reserving some to add towards the end of cooking. Season with salt + pepper. Saute for about 5 minutes. Add enough water to cover (about 4 cups) and place the lid on the pot. Bring to a gentle boil, and then reduce the heat to low. Simmer for about 45 minutes. Add the reserved cauliflower and cook for an additional 15 minutes, or until tender. Working in batches, puree the soup in a blender (or use an immersion blender). Add more water if it's too thick. Taste and adjust seasoning. Ladle the soup into bowls and snip fresh chives over the top. Sprinkle with breadcrumbs. This is great to know, I’ve had trouble in the past with cauliflower soups being bland…and the chive blossoms are the perfect touch! 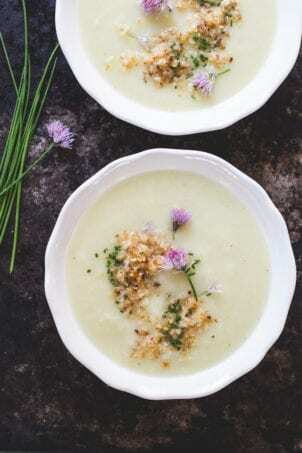 wow beautifully captured post.. i do love a good cauliflower soup, thanks for sharing the recipe. Love the simplify of this soup and your pretty garnish! What a nice tip to know, thanks for sharing! Wow this soup looks really great. Will def. be getting my soup fix for lunch today, now! Starting a low carb diet soon socan’t wait to try this. Hi Pamela! This is excellent for a low-carb diet. Plus, it has a lovely creamy texture without the fat. 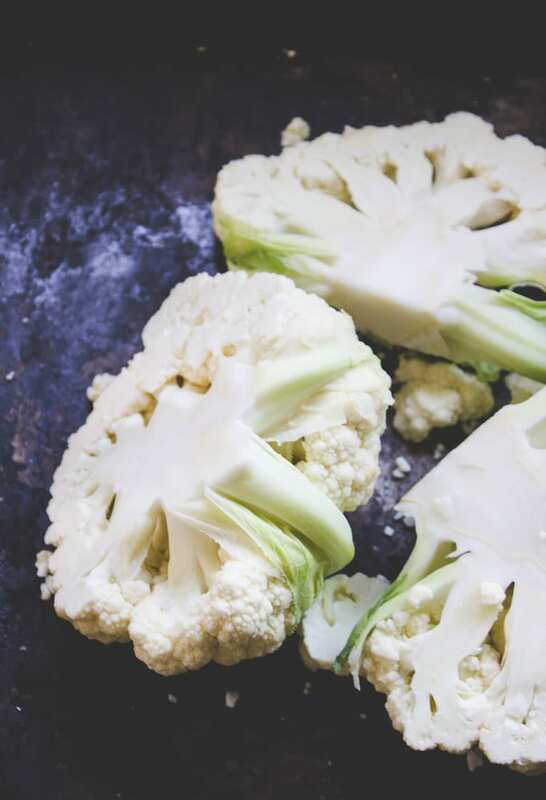 In addition to being low-carb, cauliflower is exceptionally good for you. It’s a superfood! Make a big batch to freeze so you’ll always have dinner (or lunch) ready to go. That’s what I do. Enjoy! I am a new cook and this was easy to make and turned out delicious! Thank you! Just done it; wonderful, creamy, full of flavors… thank you! I made this for Thanksgiving a few years ago and it was a HUGE hit. I’m about to start a batch for this year’s Thanksgiving and plan to freeze it to take a few to dos off my list the week of. Hopefully it’s just as delicious after being frozen! Hi Jessica! That’s fantastic! I’m so glad the recipe was a hit. You know, the holidays are all about getting ahead and mastering that to-do list, right? Regarding freezing the soup, it should work well. It’s not like a pureed potato soup where the texture tends to change after freezing. Hope this helps! Enjoy! Superb recipe. I found the following to be useful: (1) Under-season the bulk of the soup, then add a touch of salt and pepper to each bowl when serving–this is a soup that benefits from being slightly “bland” rather than highly seasoned. (2) Toast the panko quite lightly, no darker than the colour of golden sugar. (3) Reduce or omit the EVOO from the panko (it’s unnecessary, and it can leave the panko tasting oily).